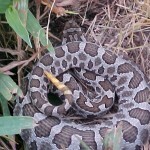 Take a look at these exciting pictures of the rattlesnake. 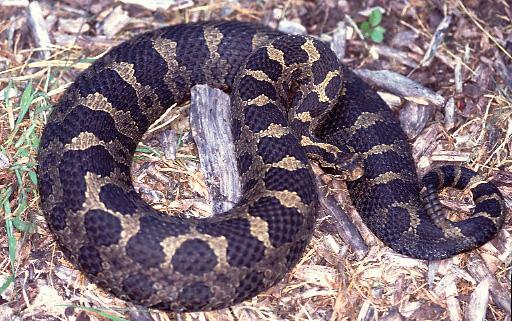 The meaning of Massasauga means “great river mouth”. This indicates that these species prefer to dwell in watery areas. One has to hear these species very closely in order to make out their rattles that produce sound. By nature, these species are very timid; they abstain from inhabiting in human areas. These species have their poisonous variety only in Michigan and Ontario. These species mainly inhabit parts of USA. They can also be spotted in the South-western regions of Ontario, Michigan, Arizona and Northern Tamulipas etc. Size of Eastern Massasauga: The adults in these species usually attain the size between 18 – 30 inches. 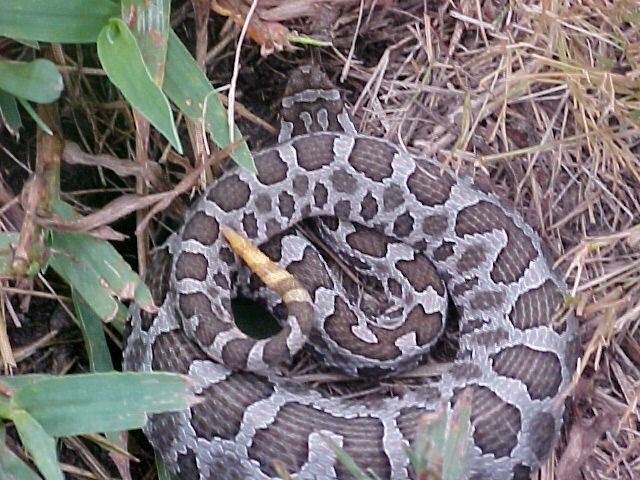 Color of Eastern Massasauga: The original color of their skin varies from grey to the darker tan dotted with black marks especially on the dorsal side. These spots can also be arranged in alternative three rows. The juvenile ones have a similar pattern on their skins. Head of Eastern Massasauga: These species have triangular shaped head along with the sensory pits located between eyes & nostrils. They possess vertical pupils. 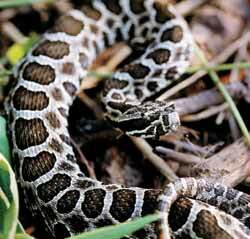 Rattle Of Eastern Massasauga: Just like other snakes, these species also possess rattles located at their tail tips. This is what they use to produce their rattling sound, hence the name. These species usually roam about in the daytime. These species react very slowly in comparison to others of their kind. These species produce clattering sound with the rattles. This sound doubles up as an indicator for arrival of the rattlesnake for others animals. These species have a tendency to prevail under the rocks or bushes. These poisonous species bite human beings when irritated. These species like to have mammals, insects and other animals in their diet. 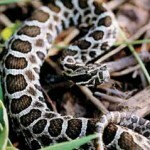 They also thrive on small lizards, frogs, small snakes and other reptiles as well. These species usually like to dwell on wetlands, swamps, and marshes. They intend to move to open meadows and grasslands during the summer. They inhabit at a height below 1500 m above sea level. 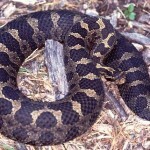 The eastern massasauga rattlesnake usually mate between months of April and May. In case of these species, the eggs hatch inside the female counterpart. Each clutter consists of 5 to 15 juvenile ones. It is seen that these species reproduce either each year or in some cases, every alternate year. 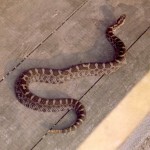 The rattlesnake females have a tendency to quit their offspring once they are born. These species cover under the rocks in order to protect from getting prey. These species use their teeth to inject the poison within the body of the target. This poison breaks off the red blood corpuscles and weakens the target. As a result, these species can easily swallow up the target. The color of their skin helps them to disguise from the eyes of the predators. These species use the poison to protect them from the teeth & claws of the target. The poison has some digestible proteins. The poison let out by them also prevents the clotting of blood therefore, the death of the victim is assured. However, the poison is not fatal for human beings. These species shed their skin in a span of 3 to 5 years. Every time they shed, a new section appears on their rattle. These species usually live for about 18 years. From October to April these species stay very inactive with low metabolic rate. These species usually hibernate in isolation or in clans inside burrows. In order to preserve the population of rattlesnakes the Federal & State laws have laid down some principles. These norms are followed in various parts of Canada and USA. According to the reports of IUCN, these species are in the list of least important. However their population is endangered in parts of Canada.